One of my fond memories of elementary school was the introduction of writing with a “cartridge pen.” Fountain pen was the proper term, but we sophisticated writers could relate to the cartridge pen. The pen of the day was the Sheaffer pen—medium point, black ink, no exceptions to the rule. And all papers were to be written with the fountain pen. I longed for the day when I would get my first real pen. I was so excited. I loved the sound of the pen moving across the paper as I formed my letters and the inconsistency of the ink was just heart-stopping for me. But the day I absolutely lost all feeling in my toes was the day one of my friends came to class with her “extra” pen, loaded with a cartridge containing Peacock Blue ink. Are you kidding me? Who could afford Peacock Blue ink or a second pen for that matter? As I watched Miss Prissy write all day with that beautiful ink, I vowed that one day that would be my color of ink for my writings—Peacock Blue. About seven years ago, I was in a general merchandise store that was going out of business after many years. In fact, I think the store was in its second generation of family members who had owned the business. As I was browsing around, my eyes fixed on two bottles of ink, still in the original boxes and covered with dust. You guessed it—Peacock Blue ink. I grabbed them like I had found a 50-carat diamond. Those bottles are now in my desk drawer where I guard them. I boast and say I have the last two bottles of Peacock Blue ink in the free world. And I figured out a method to reload empty cartridges so that I can write occasionally with the priceless liquid. I love to look at the old bottles with the inkwell inside the bottle. Years passed and my love of fountain pens has never wavered. I have a pen box that I keep on my desk where my pens are stored. They are cherished because most of them have been given to me by special people in my life. My husband, Neal, gave me a beautiful pen for Christmas that I will add to my cherished collection. I love the way ink runs onto the paper and how it needs to dry. I slow down and write just a little better when I have a fountain pen in hand. When sharing my passion with people, I get mixed reactions and horror stories of ink all over fingers, pens leaking in purses, and being out of ink when you need to write. Others just love fountain pens. Alexandra Stoddard and I exchanged notes right after her post to this blog. I kept her lovely note written with white ink on navy blue stationery. Oh my, I felt my toes going numb again, just like before. I am thinking my new favorite color of ink will be white. Please share with me your wonderful stories of writing with your first fountain pen. Dear Phyllis- your mention of peacock blue ink unlocked some very old and forgotten memories. I can STILL remember the first time I saw it and wanted to have it. i remember writing with fountain pens all through grammar school. I had totally forgotten that part of my childhood. Penmanship was a class and I always tried to improve my penmanship because I was a leftie. Now in my 70’s I do a lot of genealogy and love writing the names of ancestors in my notebooks with my ball point pen. (I downtown even OWN a fountain pen any more!). You’ve inspired me to buy a fountain pen after all these years. Actually, I just realized I’ve always LOVE writing with a good pen. In fact this morning I was thinking of making a list of some of my favorite things and after reading your blog, I definitely will put writing with a fountain pen on my list. Love your inspiring blog! A few years ago I started using a fountain pen, maybe even after reading Alexandra Stoddard’s book and fell in love with the look. I’m not sure if anyone else mentioned this but Pilot makes a ‘disposal’ fountain pen the ‘Varsity’ if anyone wants to test drive what it’s like to write with one. I was using one of my Varsity pens for some greeting cards and found the nip got clogged, just something else to be aware of when you’re using a fountain pen. In remembering inks and pen staffs and nubs, your thoughts took me back to the many evenings I spent with my father as he prepared signs for our retail store. He was a self-taught calligrafer to use the different tips to shape attractive lettering. I can close my eyes and be transported back to those precious hours. I would write letters to my grandparents who lived many states away from us and pretend my curving letters looked like my father’s. I can still conjur the aromas of the inks. Thank you for these moments of “being with my father”once again. I know that is when I began my love of written notes and letters and paper. I know without a doubt that this was a special gift from the man who helped shape me for life! The Goulet Pen Company, an on-line shop that specialises in fountain pens, has a lovely selection of inks and cartridges. You can also order samples of most of the colours/brands they carry. I learned to use a pen with an Estherbrook. All of the girls lived for them. They were quite small and came in colors. There were no cartridges. One had to go get ink from the great big bottle on the teacher’s desk. Had I ever found peacock blue, I would have loved it. Everyone couldn’t wait until 5th grade when we could use cartridge pens, and all those refills. Just remembering the whole process again, is exciting. Today, I have favorite gel and roller pens, that give me the same anticipation, when addressing Christmas cards. I learned calligraphy and taught my son, and then used the pens, to fill out the place cards, at his Junior Prom dinner. It’s a rare, special touch, when you receive any handwritten envelope, and someone has used this pen and ink. Thank you for the lovely memories. I just loved writing with pen and ink in elementary school. I still have my pen and a number of my father’s pens. I would love to know more about them. I will have to do a little research. For those inquiring where to find fountain pens and inks, see the links below. They have beautiful pens and inks in practically any color. (I don’t have any financial interest in either company). And for those of you bemoaning the vanishing art, not all is lost. There are many fountain pen and ink lovers out there. Just visit these websites and you will see. This really has been a walk down memory lane. I’d forgotten about peacock blue ink! It was one of my favorites, too. I so enjoy using a fountain pen, but I dropped my favorite Waterman and the nib bent just enough that it really scratches. I hope that using it anyhow will reform the nib, since they do conform to your style of writing. 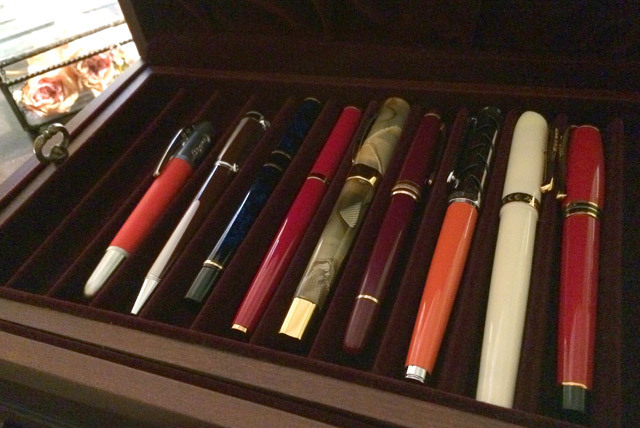 I have a small collection of antique and new fountain pens that I keep in a standing pen box with a glass front. I keep the box on my small antique desk, along with dip pens and stands. I just love writing with these pens. I enjoyed reading such good memories on this blog. I remember using fountain pens with ink cartridges in school. I remember how the nuns would check our penmanship and teach us expertly in cursive “writing”. 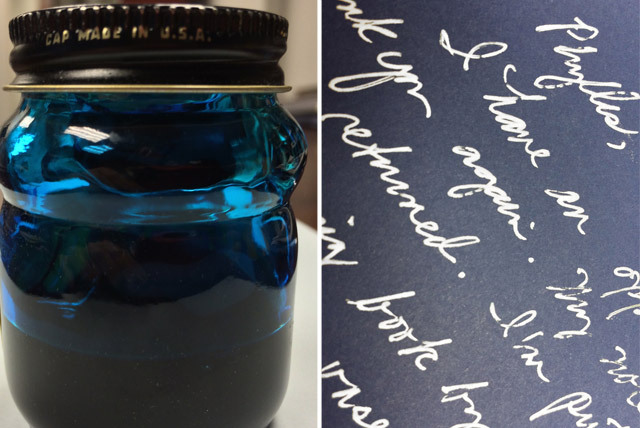 A few years ago, my husband gave me a beautiful fountain pen and bottles of blue and black ink. You all have inspired me in 2015 to learn how to master filling the well and to reclaim my lost art. Now I just need to find an outlet for the super thin onion paper that I use to write on in high school for my special letters. Thank you! Thank you, everyone, for the beautiful stroll on Memory Lane this morning. It’s wonderful to discover so many kindred spirits still keeping the old practices and enjoyment alive. I had nearly forgotten the slot in my school desk where my pen rested, and the blotters that were readily available on my mother’s desk, most from a bank or insurance company. 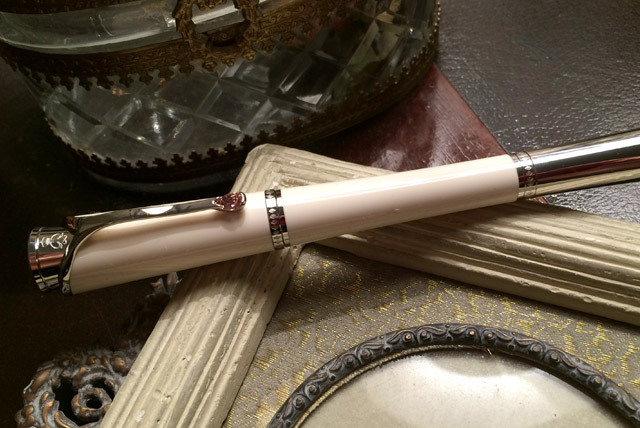 I have several cartridge pens, but my pride and joy is a Mont Blanc fountain pen that had been a business gift go my husband which he gave to me. You all have encouraged me to use it more often. Perhaps I’ll write more notes to my grandchildren, forcing them to decipher the written code of script instead of the printed email. Those in high school are now starting to try to develop their personal signatures. One recently commented on a letter I wrote him two years ago which he has finally been able to complete. Maybe they will become intrigued enough by the lost art that they will give it a try. Oh the memories that just came rushing back to me!! I loved peacock blue ink! Immediately I thought of the bottle of ink and how my fingers looked when I refilled my cartridges…..also brought back memories of our writing teacher Mrs Poer…..not sure how she spelled her name! also the old desks at Rocky Ridge Elementary with the ink wells! Thank Phyllis….I enjoyed the trip down memory lane!! I have a small collection of ink pens as well, and lovely ink wells, but unable to find ink and/ or /cartridges. The place used to buy them went out of business. Where do you find your inks? I would try Levenger. They specialize in items for the reader and writer. They offer their own ink, Levenger Bottled Ink, and it comes in a heavenly array of colors. No “Peacock Blue” but there are several lovely shades of blues and greens among the choices. I buy Sheaffer cartridges for my pens as well as bottles of ink from Staples. As I was reading all of these lovely posts, it reminded me that I was given my great grandmother’s gold and mother-of-pearl dipping pen. It was a gift to her on November 29, 1889. It is such a treasure not only for its beauty, but the note that came with it saying that my mother was named after her. I am thankful for family members who take the time to record such information. My great grandmother’s name and this date are written inside its case in such lovely script with this pen. You have a beautiful collection of fountain pens! Great post. Sadly, I am not of the fountain pen generation but was always intrigued with my grandmother’s fountain pen and liquid inks…she was a letter writer and watching her write with her “special ” pen was such a treat. Many years later my husband received a Waterman pen as a gift and I immediately claimed ownership! I don’t use it as often as I’d like but once again you have inspired me, Phyllis,to pick it up again…happy writing! I sat next to her in Mrs. Brockett’s 4th grade class-Charlotte Smith had the most beautiful handwritting. Mine paled by comparison, but I was determined to practice until I could have my own flourish of written beauty. I already loved ink pens and preferred the ease with which they glided over paper. I did not know that Charlotte’s gorgeous penmanship and my love for cartridge pens would grow into not only a beloved hobby of calligraphy but collecting antique pens and ink as well. Your article stirs a tickled joy inside looking at your collection and reading a shared love. Thank you! Recently purchased a Schaffer, worked just like when in high school. Michaels had better prices, Hobby Lobby had better selection. Still looking for another source for pens ink and calligraphy materials. Thanks for sharing. Hello Phyllis … You’ve done it again – recalling fond memories of a simpler time . You never cease to amaze me ! How apropos is your post ! My dear friend came to visit earlier this week and we recalled our elementary school days from the late 50’s and 60’s at St.Jane Frances. We were taught penmanship and practiced our cursive writing with “Zaner-Bloser” pens. The pens came in different colors – each grade had a specific color . I remember very well using a fountain pen years ago that was given to me as a gift . I will be reaching for that pen soon and searching for a jewel toned ink . My Christmas cards and gift tags were signed with gold/glitter ink this year . Elegant . My fountain pen will have a new life – thanks to your lovely post ! I love fountain pens, too. I purchased a cartridge pen and several cartridges a few years ago, but most of the cartridges were dried out. Some day soon, I am going to check online to find a beautiful pen to use for writing in my journal. Love your blog! My fifteen year old son collects pens. I will show this to him as he also loves fine writing instruments. May I ask where you acquired your pen box from? I would love to purchase one for him to properly store his collection. I haven’t been able to locate a nice box as yours. Thank you! I am a calligrapher and even taught in it in middle school. I refilled ink cartridges with a hypodermic needle. I lovev the ink bottles with the ink well in them. 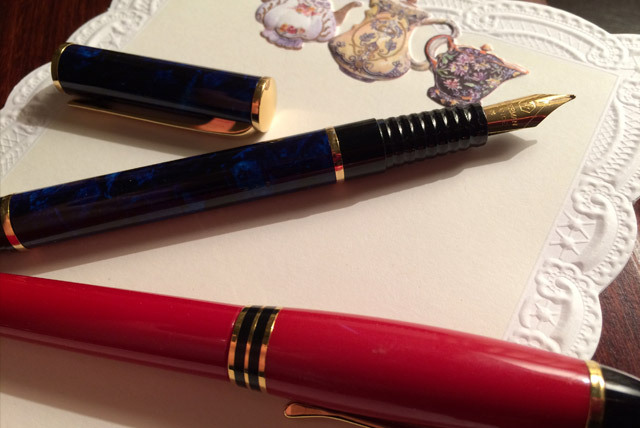 What a lovely memory of fountain pens you evoked for me! I still have a few old pens but, alas, no source for the ink. Everything in office supply stores is limited to those automatic ball-point pens; when they are done, they are done. The closest I have to a fountain pen is something called a “Uni-Ball Vision” that comes with blue or black ink. Yes, ink. However, once those pens are done, they are done. Along with graceful fountain pens are fine stationary, similar to the papers pictured in your blog. Fine stationary is becoming harder and harder to find in my little town. Shops and boutiques specializing in fine papers just don’t exist here. I must search for other sources with mail-order capabilities. Your post today has me smiling all over my face! It is rare to find someone who loves pen and ink as much as I do. Besides cobalt blue, my favorite inks are amethyst and cocoa. Thank you, Phyllis! I remember putting in the peacock blue cartridge, replacing the black cartridge. I loved watching the black ink remaining in the tip changing to the prettiest deep indigo blue and gradually the peacock blue would appear. Loved the peacock blue, but there was something deep and mysterious about that gorgeous indigo blue. Thank you for this sweet walk down memory lane. I just love this! All of these folks who love writing with a fountain pen as much as I do! I still have the first Schaffer pen I bought when I was 12 to write in my Diary (the one with the key!) and it still writes. I also have a large collection of inks and cartridges. I love writing with my pens and have always lusted after, but still can’t afford, the beautiful expensive ones. Maybe some day…. It’s nice to know that I’m not alone in my love of writing with a fountain pen. I used one in both elementary and high school and enjoy using my pen for writing letters, thank you notes and cards. It’s sad that we are a vanishing breed! I also have the pen that was used by my late father. I treasure his pen, knowing that he used it to write letters and notes. I still correspond with several of my high school classmates, and two out of three of us use our fountain pens. Oh my goodness, you have touched on a topic near and dear to my heart! I love writing notes on beautiful paper with my Waterman fountain pen in my best cursive. My beloved English teacher, Mrs. Robinson, in Mt. Pleasant, SC taught me to appreciate that fine art many years ago. 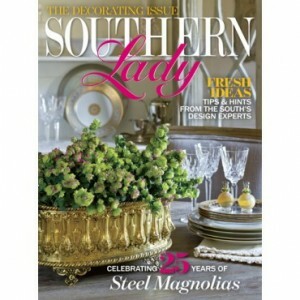 And my mother taught me that a proper Southern lady ALWAYS writes a thank you note. I just retired from Clemson University and find it disturbing and a bit sad that college students do not know how to even sign their own names in cursive, much less know how to write a thank you note. I actually taught a class on writing thank you notes and made them practice! Thank you for your post on such a gray and dreary day…it certainly brought a smile to my face!! What a great memory you have brought back: St. Thomas Aquinas School, fourth grade in the 1950s, learning cursive and my first fountain pen. The preferred fountain pen was an Esterbrook, but they were too expensive. I think mine was a Shaeffer. My favorite color of ink was and is peacock blue. Our desks had inkwells to hold the glass jar of Scripto Ink, and the pen had to be filled (this was before cartridges). Several years ago I bought a Venetian glass pen that one dips into the ink. It has channels near the point down which the ink flows. In a catalogue I found a bottle of purple ink (another favorite color) made in Italy with the aroma of violets to pair with the pen. I use them to write in my journal. Writing with a fountain pen is such a sensuous experience, especially with scented ink. 5th grade paper on a state in our Union. I chose South Carolina, not knowing that one day it would be our favorite vacation spot. My dad brought home my first fountain pen, just as you described, with blue ink. I have no idea if it was “peacock” blue, but it was blue. My paper was to be about 12 to 14 pages long. I had to take extra care because I am left handed – you can imagine the special care and the “do overs” i had to make. But I turned that paper in in perfect shape, not too many smudges. That was my first and last with a cartridge ink pen, but it was an experience children seldom have now. This really brought back memories of how my dad took interest in my school work. Vicki, I am a lefty, too. I went through several bent nibs before I figured out how to write at exactly the right angle to avoid bending them. When as an adult I began writing again with a fountain pen, I remember thinking I forgot about buying a blotter, and I really needed one. I think one smudges less if right handed because the hand is moving across blank paper. You wear that ink for awhile when you smudge. I did find a small rolling blotter in the Victorian Trading Company catalogue. It has nice stationery and desktop items for those of us who still enjoy writing in longhand with fountain pens. Maddalena, I used to subscribe to and shop from The Victorian Trading Post until the catalogues faded away. I assumed the company went out of business. I’ll search for it online and see what I can find. I am looking for fine writing papers for personal handwritten letters. Office Depot stocks some beautiful business papers, with envelopes, and I maintain a small supply at home, but I want something of a hand-made look ~ until I learn to make my own one of these days. The catalogs are still there, you just have to ask them to be sent! You can also get emails so you can see the sales as well as free things when ordering. It is still an awesome website and it is so enjoyable to get nice mail that you can sit with a cup of tea and perused the catalog. Is Peacock Blue ink still out there for purchase? I don’t have any memories of this colour growing up, but it certainly looks quite beautiful! Thank you for sharing! Loving your post, as it brought me back thru the years and into my elementary classroom! Oh I remember being so excited to learn cursive and to finally use such a sophisticated writing instrument! I was now “grown up”! My love of beautiful paper and the art if writing have always been a special part of my life. So nice to know that there are others who still cherish this manner of communication! Peacock Blue was my “signature color” for ink in middle school and high school. I refused to write with any other color, and my teachers were indulgent. I still love to see the beautiful cursive letters take shape as I touch my pen to paper! Love reading your blog. I also love fountain pens. I remember starting out in Catholic Grade School. It was a really big deal to be old enough to be allowed a fountain pen. I’ve always loved writing and the nuns made sure I had good penmanship. Seven years ago I had a stroke. I was so disappointed and upset that my handwriting was so badly affected. I was so proud of the my handwriting. Now though I am much better. One of the things I’ve learned is that writing with a fountain pen makes you slow down and take your time. This definitely helps stroke victims. Slowing down makes my handwriting much better! I love writing letters and use a fountain pen for all my correspondence. I also seal every letter with wax. There’s nothing like writing or receiving a handwritten letter. Your post takes me back to Cahaba Heights Elementary School where I first learned how to use a “cartridge pen”. Funny how easy it is to forget such small things like this in today’s modern world of gel pens and technology. Even paper is becoming unnecessary! I’m still a believer in hand written and addressed notes. Email certainly has its place, don’t get me wrong. However, there is something deeply meaningful about sending or receiving a hand written word from someone! All the more meaningful when it is penned with a timeless instrument! Thank you for slowing the pace and setting the bar high…now where can I find a “cartridge pen”? Some of us are old enough to have had lessons at Norwood Elementary School under Ms Poor’s stern instruction in learning how to make our letters with a pen dipped into the ink well on our desks….black ink that is. I still have a paper with those early scrawls that my mama kept. I am not at all sure that cartridge pens would have been acceptable to her and peacock blue-green would have been deemed vulgar, if commented upon at all ( My grandmother would have said something bore no notice let alone mention of it.) …Hold-overs from an earlier day. Perhaps this is why some of us are still snobs about the real note-writing on good quality bond, mailed invitations to occasions, an inventory of real black ink pens, and an abhorrence of impersonal “e-vites”…but then, spelling is also an issue these days. Much love to you and grateful for standards that are still published in books and magazines. I went to parochial school, and I was surprised that the nuns allowed me to write with my peacock blue ink, we were regimented in so many other ways.. This has been a trip down memory lane for me ! Yes, I remember the desks with the inkwells and the bottle of ink sitting there. The nuns who taught me were very strict so no peacock blue ink for school. However, it is my favorite color to use today for taking notes and writing personal notes. I discovered Pilot G-2 07 pens. their peacock blue is perfect and makes me happy. For lovely pens try Levengers catalog. There are other catalogs that arr dedicated to pens and inks. Google ‘fountain pens’. Order one pen and the emails will follow. I love these stories, which we would miss had we all written notes to you with our fountain pens. It’s funny how ink can play these parts with lives. Although we never used cartridge pens in my schools in the 60’s, my mom had one. As soon as I was out of school and had a job I bought one. Peacock blue ink was also the big splurge for me. Then years later I was in an our little office supply store here in Cranbrook and what should my eyes rest upon but a package of Kings Gold cartridges (I bought the last 4 boxes)! For years I’ve eyed up the ‘Jeweled palette of inks (5 COLOURS! ), with the glass blown fountain pen’ in the Victorian Trading Co. catalog. One day…! Phyllis, Best Ribbon In My Journal Ever! I sat in my wooden desk in Cleveland, Ohio as a third grader with my bottle of ink and my pen resting in the grooved pen holder at the top. French and spencerian script was the order of the day back in 1949! For us it was the Palmer Pen method. My mother and aunt had also learned that method, and they had gorgeous penmanship. I was too much of a nonconformist to stick to it. I liked putting swirls and curlicues in my script. My penmanship never equaled that of my mother and my aunt. I do remember the blotter. We were not allowed to use Southsea Blue. Many of us loved that color, but we had blue ink. I was brought back to the first time I learned cursive writing when I took a calligraphy course. It was like learning to write all over again. It was an exciting time. We took such pride in our writing. I feel saddened that children are not learning this wonderful craft. Choose your color and enjoy that would be what I would tell children today. Bet they would love it! I too love fountain pens. I’ve been looking for years for a roller blotter. I think Peacock blue is just the most beautiful color. Nothing writes quite like a fountain pen. Notes are so much more personal I think when you write with one. We must be of the same generation, as I also remember getting a fountain pen and filling the empty cartridges with peacock blue ink. We wrote on paper that was so thin, that it would show through to the back of the paper. To this day I love to write with a pen and ink. We lived in the best of times. I recently got out my Sheaffer ink cartridges that I kept with my calligraphy ink pen nibs. Red, blue, black, green! To my utter disappointment, every unopened cartridge had dried out! Oh to have a bottle of your peacock blue! And, yes, how do you refill your pens? I, too, loved peacock blue ink in elementary school. We were required to write with a fountain pen to practice cursive writing. Unfortunately, I spilled that beautiful blue ink on the rug in the den! I didn’t get in trouble, but that spot remained as long as my family had the rug. Peacock blue is still one of my favorite colors. I love your memories and I thank you for sharing. I still have my pen and pencil set, from the 50’s. My parents gave this special gift to me for my birthday. I have a fondness for peacock blue ink, but I also love lavender ink. Several years ago at an antique store, I found an empty, small clear faceted ink bottle, without the lid. Of course I had to have this beautiful bottle. It brought back treasured memories of writing with peacock blue and lavender ink. I too love writing with a fountain pen. I keep mine on my writing desk in a long she’ll I found at Amelia Island. Going antiquing with my girlfriends tomorrow and I am going to look for peacock blue ink. Thanks for sharing. God bless! This makes me recall years ago when I use to love writing with calligraphy fountain pens. I love fountain pens also. I got my first pen, a Sheaffer, when I was in high school. We has to use them for our shorthand classes. I have loved them ever since. Please share your secret on how to refill the empty cartridges. I love your post. I have noticed your signature, and your handwriting is beautiful. Just right for fountain pens. My mother had nice handwriting also, and when I was young she used a fountain pen. Such great memories. Goose bumps!! That’s what your post gave me today and such fond memories. It was Mrs. Stancil’s fifth grade class that opened my mind and eyes to the exquisite world of “cartridge” pens. We had to use black ink for practicing the fine art of penmanship. However, how excited many of us were when she told us we would be using indigo blue to begin our poetry notebooks. Today, I credit her and my mother’s standard of excellence for my love of fine lettering. Writing with a fountain pen gives those of us who love to write, the same feeling as skating on clean ice or maybe floating on air! Thank you, Phyllis, for bringing sunshine to this bleak January day. I love the way you bring a memory to life, Phyllis. I could just see you at your desk in school holding the pen and bending over the desk. And feel your joy at finding that lovely, Peacock blue ink after so many years! What a treasure. I have not been one to use fountain pens, but you have inspired my interest in doing so! I am a fountain pen addict also, I still use them for special letters, cards, notes, etc. Love Them!! Thanks for the post…love this blog!! !